We are looking for the most powerful person, who is not afraid of any obstacles. Hey! Are you there? Choose your best ninja and fight against the strongest dragon! But first, kill all foes on your way to the win. We know that you will do it. Take care! Welcome to the east, where ninjas are the most powerful warriors. You will be sank into the wordl of danger and jeopardy. 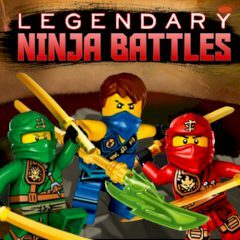 Fight the Ninja’s greatest enemies in Legendary Ninja Battles! Kai, Cole, Jay, Zane, and Lloyd are all powerful Ninja, but only one can be crowned the best Ninja in Ninjago. Play through a series of epic boss battles to find out who will claim the title of Greatest Warrior! Is everything clear? Then do not waste your time fight like the warrior. We know that you will cope with it easily. Good luck to you! Have much fun while playing this game.